Customer published image:Mouse anti Human CD205 antibody clone MG38 (MCA2258) used for the evaluation of CD205 expression on dendritic cells by flow cytometry. MR and DC-SIGN expression by DC is increased after ECM treatment. 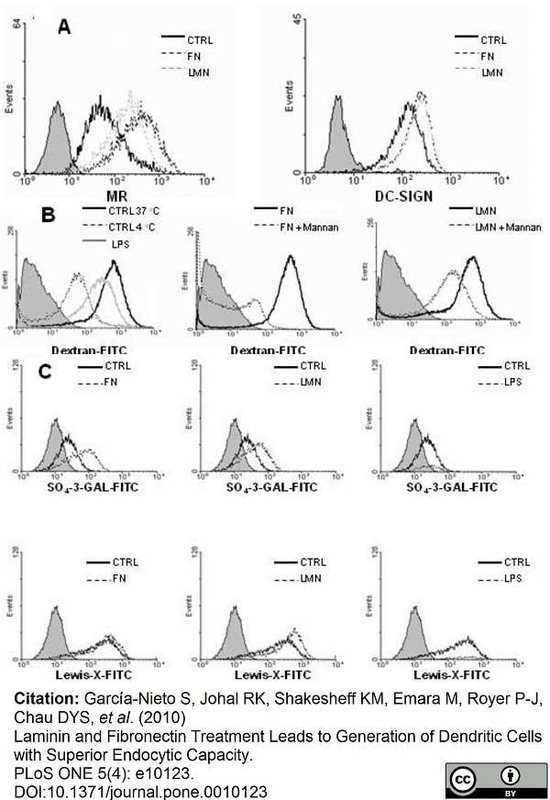 A, Following 48 h of culture in FN or LMN-coated plates (both 10 μg/ml), DC were stained for MR and DC-SIGN expression and analyzed by flow cytometry. Filled histograms (gray) represent isotype controls. B, The endocytic receptors MR and DC-SIGN were blocked using mannan before addition of dextran-FITC and analysis by flow cytometry. Filled histograms (gray) represent cells without dextran-FITC and results depict one representative out of three. C, The uptake of specific MR and DC-SIGN ligands by ECM-treated DC was also evaluated by flow cytometry. The sulphated sugar SO4-3-galactose-FITC is specifically bound by MR and Lewis-X-FITC by DC-SIGN. 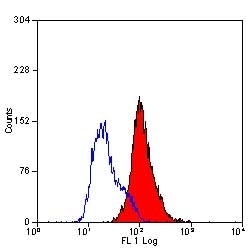 Filled histograms (gray) represent cells incubated without ligand. Results show one representative out of three independent experiments. Laminin and Fibronectin Treatment Leads to Generation of Dendritic Cells with Superior Endocytic Capacity. 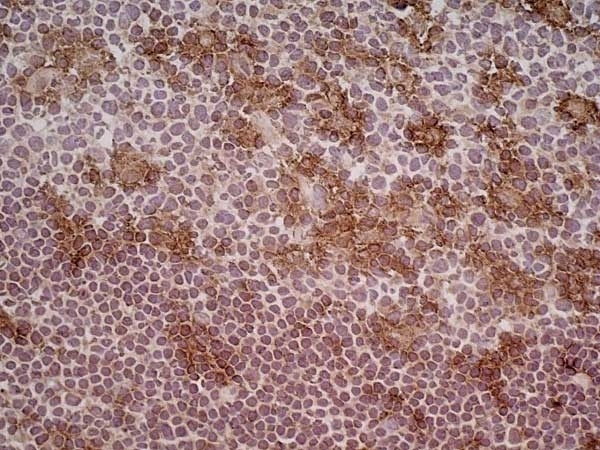 Mouse anti Human CD205 antibody, clone MG38 recognizes human CD205, a ~205 kDa cell surface glycoprotein that is also known as DEC205. CD205 is a multilectin receptor which in humans is predominantly expressed by dendritic cells. 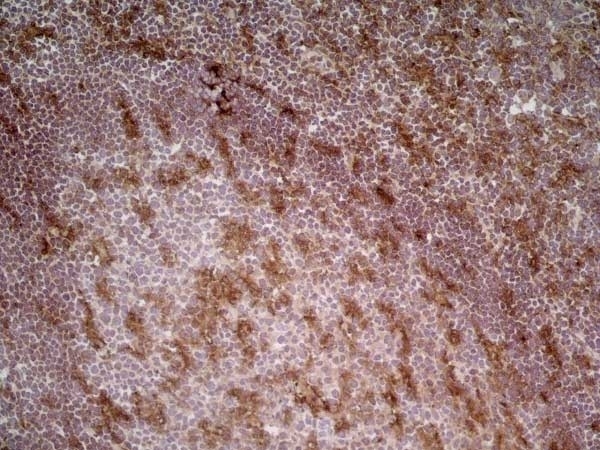 Mouse anti Human CD205 antibody, clone MG38 stains mature monocyte - derived dendritic cells and weakly stains some peripheral blood mononuclear cells. 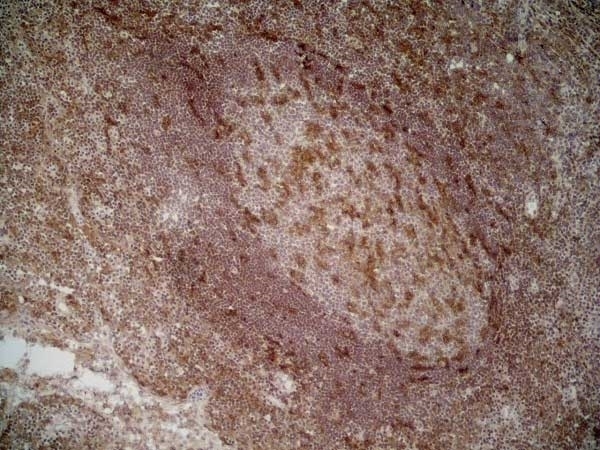 Clone MG38 also stains cortical epithelium in the thymus. 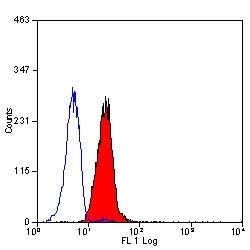 Mouse anti Human CD205 antibody, clone MG38 is routinely tested in flow cytometry on the KM-H2 cell line. Use 10ul of suggested working dilution 106 cells in 100ul. Guo, M. et al. (2000) A monoclonal antibody to the DEC-205 endocytosis receptor on human dendritic cells. Hum Immunol. 61 (8): 729-38. García-Nieto, S. et al. (2010) Laminin and fibronectin treatment leads to generation of dendritic cells with superior endocytic capacity. Mikulak, J. et al. (2010) DC-specific ICAM-3-grabbing nonintegrin mediates internalization of HIV-1 into human podocytes. Am J Physiol Renal Physiol. 299: F664-73. Hatsukari, I. et al (2007) DEC-205-mediated internalization of HIV-1 results in the establishment of silent infection in renal tubular cells. J Am Soc Nephrol. 18: 780-7. Ebner, S. et al. (2002) A novel role for IL-3: human monocytes cultured in the presence of IL-3 and IL-4 differentiate into dendritic cells that produce less IL-12 and shift Th cell responses toward a Th2 cytokine pattern. J Immunol. 168 (12): 6199-207.